The NASA Earth Observatory site is constantly releasing amazing images from space, including items such as this awesome image of Mount Everest, lava flow shapes, Laguna Verde, and many others. 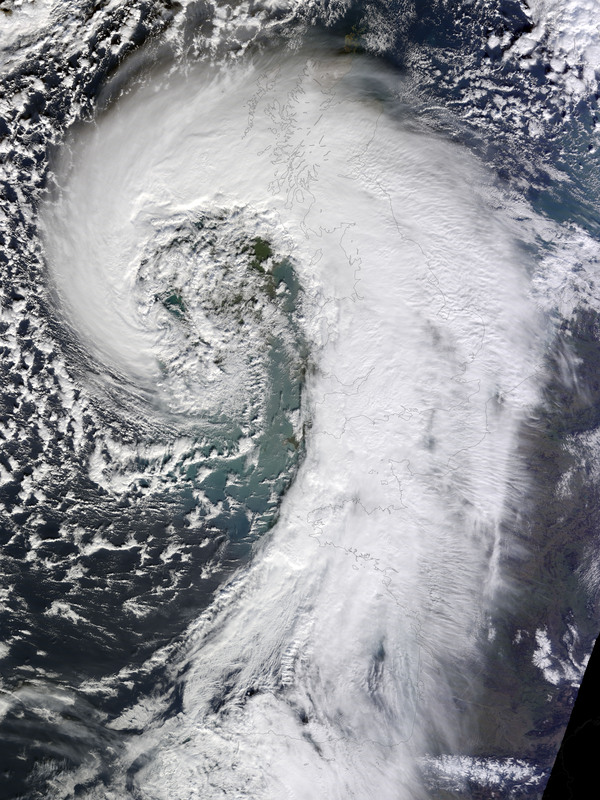 Their latest image is a stunning view of an extratropical cyclone over the United Kingdom that was captured last week. This particular cyclone brought winds of over 100 miles per hour, and caused power outages to more than 700,000 people. They released a large image to show it off, which I’ve matched up in an image overlay and included in this KML file for you to view directly in Google Earth. Read more about this cyclone on the Earth Observatory site or see other images from the Earth Observatory that we have showcased. There have been a whole series of such storms swinging into the southern UK and NW France on a southerly dip in the jet stream, hopefully now diminishing. It’s not so much that one storm like this is unusual but that the sheer number has resulted in accumulating problems like extensive floods. Google Earth and Maps are in use extensively as the base for all sorts of up to the minute weather, risk, and impact maps – something undreamt of a decade ago, but now the public takes it all for granted.